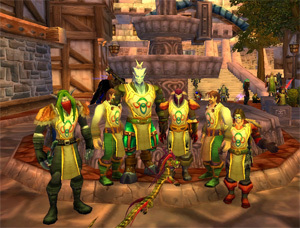 World of Warcraft is such a massive game that it is simply impossible to know and understand every single part of it. This is why having guides is so important for every WoW player. However, one part of the game that is often never utilized fully is the daily quests. After all, you may ask yourself why you would want to keep repeating the same quests every single day. Wouldn’t you rather go on and complete other quests? Probably not if those other quests don’t give help you achieve the objective you’ve set out to do. Because there are so many daily quests available, it can be difficult to figure out which ones will actually help you. However, a daily quest guide like Dugi’s Dailies and Events Guide will help by calculating which dailies are the best ones for you. The guide will take into account the reputation you need and what kind of daily questing will help you move forward instead of back. For example, someone who just needs to farm for gold will be completing different daily quests than someone who is trying to get collectible gear and items from the Argent Tournament gear. It’s very important to understand which dailies will help us out the most and focus on those. A daily quest guide will also help you formulate the quickest route possible for the things you need to know. Did you know it is actually possible to get all 25 of your daily quests finished in two hours or less? A thorough understanding of your daily quest guide route will help you accomplish the most you possibly can in the least amount of time. Another reason to keep a good daily quest guide around is to help you with your gold farming. Gold farming through dailies is a very stable source of income for your character. You will always know exactly how much gold you are going to make in one day because the dailies pay a set amount of gold per quest completion. Following a daily quest guide takes away all the risk associated with posting things on the auction house. The guide also takes away all the guesswork associated with daily quests. A daily quest guide is only as good as it is usable, so you will want to spend a little bit of time familiarizing yourself with it. You’ll need to figure out what your WoW objectives are, and then decide which set of WoW dailies you want to work on first. After all, you’ll probably make the rounds of many of the dailies eventually, and you just can’t work on everything all at the same time. Just choose the dailies that will benefit you the most. If you have daily quests for your profession, then those should definitely be at the top of your list. Otherwise, think first about reputation, then gold, and then exclusive items like special mounts and rare gear.